Today we're going back to 2007. This picture is from Sarah's wedding day. It's my brother Critter on the right, with his nephews! :D Isn't it cute?? L-R: Nate, Ethan, Justin, Michael, Stewie, Quin, Trenton, Critter. Those kids are looking so cute dressed up! The Mustangs Soccer shirt... from my kids somehow? It's like a mystery. I think Arthur wore that shirt to family reunion in 2004 (before I knew him) and somehow it lives with you. and I see it pop up in pictures a lot. It's got some mystical kid appeal. 2007 WAS a good year! Yay 2007! Oh wow! 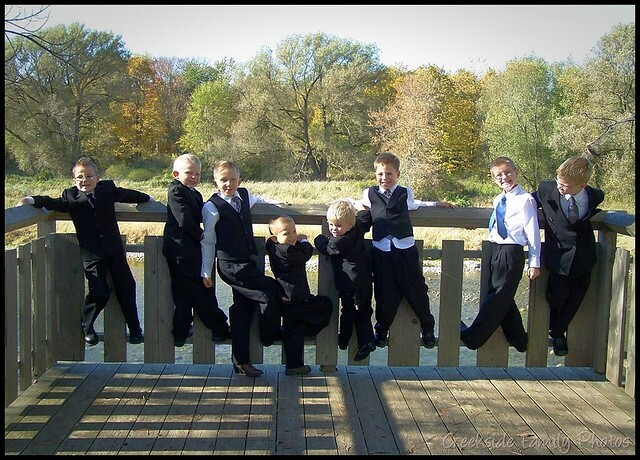 I love the shot of the 9 million boys - how cute are THEY??!! :-) Good genes in that family, I tell ya.